Batman: The Animated Series: Season 1: Episode 45: What is Reality? What’s the episode about? The Riddler returns! I love this Riddler. In his first outing, he put Batman and Robin in a physical version of his computer game, a maze with a minotaur. In this episode, he locks the Commish’s brain inside a video game, and Batman has to avoid virtual traps and rescue Gordon. Pretty good episode. When does this frame happen? About three minutes in, fake guards steal Nygma’s physical records from the police station to help erase his old identity. Why are you sharing it? Lyle ‘Crazy’ Nucamp, Sally ‘Goodtime’ Nubank, and Dave ‘Smelly’ Nugent. 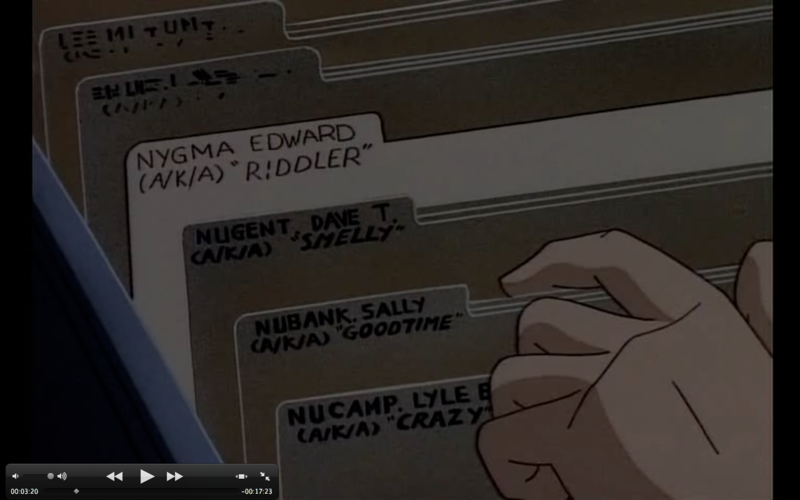 I mean, I’m glad that they didn’t make all of the text illegible, like the files behind Nygma, but those nicknames are just awful. I feel bad for them. Poor Sally. Poor Dave.